ondon theatre might have a death wish – or at least a penchant for daredevilry. After a spate of performing animals – wild ducks and Russian dogs among them – comes a veritable brattery of child actors. WC Fields, he of the famous showbiz maxim, must be spinning in his grave. 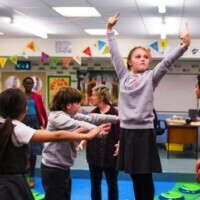 In addition to all those Matildas, Charlies and Billy Elliots, the Royal Court recently unleashed “a mutiny of eight-year-olds” in Molly Davies’s play God Bless the Child. Mind you, at the Lyric Hammersmith, the kids will be armed: the miniature mobsters of Bugsy Malone are coming to the theatre in April. Theatre academic Nicholas Ridout has argued that children and animals both disrupt the theatrical event. “We know what we expect to see onstage,” he writes. “We expect to see actors.” Animals can’t act – not even acrobatic dogs – and, while children can, we can’t escape the simple fact that they are children. That’s been used to great effect by a number of experimental companies – Ontroerend Goed, Campo and Romeo Castellucci have put children onstage, but without asking them to act, per se. When kids start acting, they become doubly fascinating. “You still have an actual child in the room,” says director Jeremy Herrin. “That blurs the line between what is make-believe and what is real.” Such slipperiness, he says, can add an extra charge to a piece of theatre. Herrin, now at the helm of Headlong, is a go-to director for shows featuring children. That happened accidentally. Having directed Polly Stenham’s debut That Face, he was also given her second, Tusk Tusk. Its protagonists were three children left alone by an absentee mother. “There was something about these children being abandoned in a theatrical space, just as their characters had been abandoned at home,” he says. However, using child actors complicates a rehearsal process. Theatres have to negotiate strict rules and regulations about working hours, employ chaperones and, often, double- or even triple-cast a production – and that’s before one even considers the art of getting good performances out of them. Herrin aims for understatement, and says that can be difficult to find. “They can be very stagey,” he says. “Lots of kids are taught how to imitate something, rather than express what it is.” Their tastes, he adds, are often quite sentimental and melodramatic: big emotions fully realised, rather than psychologically real. All of which raises the question of precocity, that cliche of child acting – all fluttering eyelashes and mile-wide smiles. Ridout is brilliant on the subject: “The precocious child is uncanny and (onstage at least) unpleasant.” He suggests that they imitate acting, rather than merely acting, and so add extra layers to the way we watch. “They tend to appear as mini-adults,” says Ridout. That’s not entirely uncommon, either. These are exceptionally talented performers and they’re doing a roaring trade, whatever WC Fields might say.